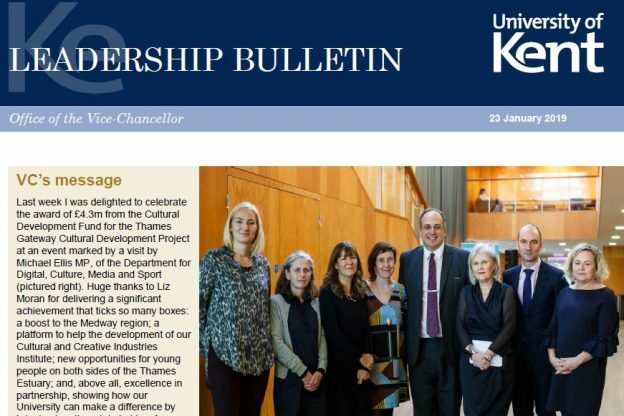 The latest issue (23 January 2019) includes congratulations from our Vice-Chancellor and President, Professor Karen Cox, to all involved in the award of £4.3m from the Cultural Development Fund and in bringing together leaders from business, local government and academia for the Kent Business Summit in our Sibson Building. There is also an update on Executive Group and Extended Executive Group (Executive Group plus Deans) meetings, including discussions on University innovation and on postgraduate students.. The ‘Long Read’ focuses on International Kent and is written by Professor Karen Cox and Anthony Manning, Dean for Internationalisation. This entry was posted in Campus online on 23 January 2019 by Wendy Raeside.